Please join​ us to celebrate the publication of Vicinity/Memoryall, a play written by Christine Deavel and J.W. (John) Marshall, the former owners of Open Books. Vicinity/Memoryall follows two characters as they move through a disorientingly changing urban landscape, seeking a memorial to an act of violence that ​stained​ their culture. They share the stage with a character whose quirky personal stories speak lyrically to their ​effort​. 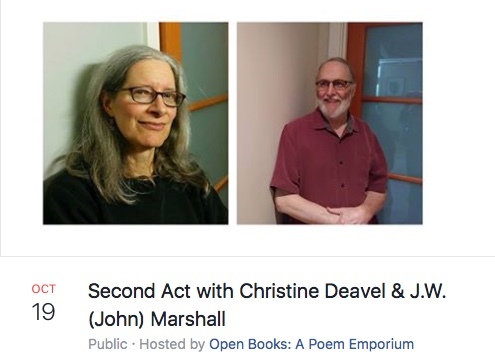 Christine and John will read from their​ play and read pieces of other plays they admire. T​hey ​will discuss the process that brought the play to life and to completion and hope to take questions and not be sorry they did. This event will include a viewing of a short film by Sarah Lintakoon, winner of the press’s 2018 Emerging Visions Filmmaker Award. Her film, Olive, draws on themes in Vicnity/Memoryall ​while​ wholly being a product of her own vision. ​Christine Deavel is employed as a Patient-and-Family Liaison at Harborview Medical Center. In 1995 she collaborated with J.W. Marshall, opening Open Books: A Poem Emporium which they ran until 2016. She has published poetry and prose in countless magazines and journals. Her full-length poetry collection, Woodnote, was published by Bear Star Press and won the Washington State Book Award for Poetry. J.W. Marshall originally started Open Books as a small general bookstore in 1987. The store was moved to its current location when it was converted to poetry-only. After selling the store to current owner Billie Swift in 2016 he has kept house and happily found more time for reading and writing. Poetry and prose of his has been published in a wide variety of magazines and journals. His full-length poetry collection, Meaning a Cloud, won the Field Poetry Prize and was ​published by Oberlin College Press. Christine and John co-wrote a chapbook of poetry, Work Together, in 2014. They hope to see their play produced in 2019, bringing new layers of collaboration into their creative process. 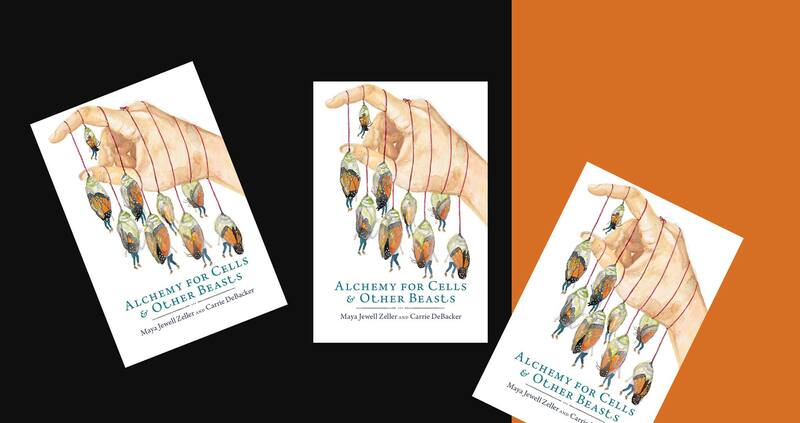 Alchemy for Cells & Other Beasts: Seattle Book Launch! This event, a celebration of the new multi-genre collaboration Alchemy for Cells & Other Beasts (Entre Ríos Press), features readings by poets Maya Jewell Zeller and Ellen Welcker, as well as the screening of a film by Rebecca Starkey. A Note from the Press: “Entre Ríos Books is proud to announce our fifth book, Alchemy for Cells & Other Beasts by Spokane poet, Maya Jewell Zeller, and Seattle artist Carrie DeBacker. This full-color collaboration charts a course into magical waters, anchoring itself in the frightening politicization of a woman’s body. The speaker in these incantations, behind these urgent watercolors, muses on the philosophies of geologic time, climate change, human genomes, and existential destruction. It is anxious work of eco-feminism, much of it written and painted after the election. Like our other books, this book ships with an audio download of the poet reading the work.” Maya Jewell Zeller is a poet, writer, teacher, editor, and mother. An Assistant Professor for Central Washington University’s Professional and Creative Writing Programs, Maya is the author of Rust Fish (Lost Horse Press, 2011) andYesterday, the Bees (Floating Bridge Press, 2015). Carrie DeBacker Seattle ArtistCarrie DeBacker is a Seattle-based visual artist and illustrator. Originally from the Chicago area, she holds a BA in Studio Art from Carleton College and MFA from Washington University, in St. Louis. 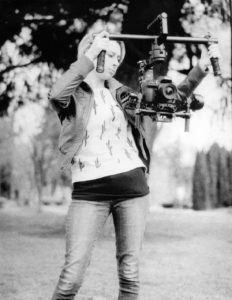 Rebecca Starkey is an aspiring cinematographer and recently graduated from the film program at Central Washington University. Rebecca is the recipient of Entre Ríos’s first Emerging Visions Filmmaker Award which is meant to encourage the growth and development of women artists and technicians traditionally underrepresented in the film and digital industry. Ellen Welcker‘s books include Ram Hands (Scablands Books, 2016) and The Botanical Garden (Astrophil, 2010). She is a recipient of a 2016 GAP grant from WA Artist Trust for her manuscript-in-progress, The Pink Tablet, and chapbook of these poems are forthcoming from Fact-Simile Books in late 2017. She lives in Spokane, WA. 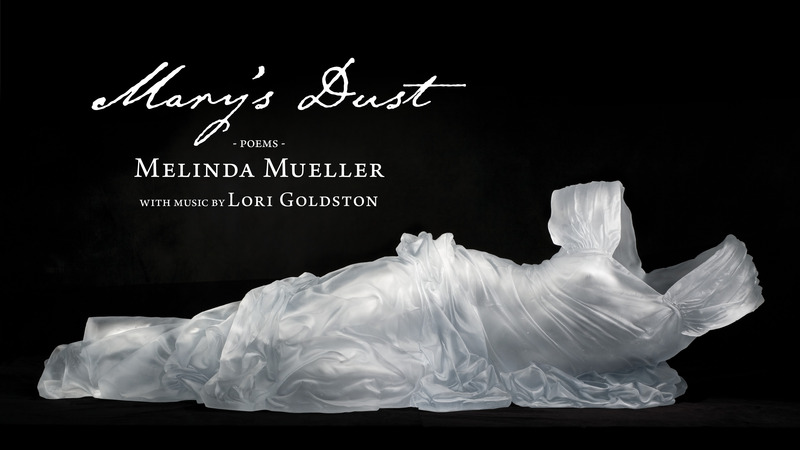 Join poet, Melinda Mueller, and cellist, Lori Goldston, as we celebrate the publication of Mary’s Dust, Melinda’s first full-length collection since her award-winning, “What the Ice Gets”. Lori Goldston will perform a suite of new music commissioned for the book (and included in the digital download) and we will also be showing a film by Christian Anderson featuring Seattle poets discussing the unqiue perspectives women writers bring to writing about history and creating their own narratives. “Melinda Mueller’s great gift is translating historical detail and scientific fact into profound human experience. Long-awaited Mary’s Dust is a tour de force, a klatch of history’s Marys speaking through a stunning array of formal constraints—much as they did in life. Each Mary emerges from Mueller’s precise and brilliant word choice and imagery to linger “with a faint ringing.” Mary’s Dust is an ambitious, awe-inspiring, marvelous collection.” — Kathleen Flenniken, author of Plume. PLEASE NOTE: the reading will take place in the STREAM Building, with its enterance Spring street, between 12th and 13th.